I cannot say what the process of becoming honest is like for the occasional white-liar, but people who practice deceit definitely have great difficulty quitting. I have probably detailed in some post or other my own experience of giving up the practice of lying cold-turkey by forcing myself to publicly confess every single new falsehood I uttered, and doing so the moment the words left my lips. It involved a level of red-faced humiliation and personal exposure I was very much unused to. Rarely was a confession received in quite the way I expected. I suppose all bad habits are hard to break. Jacob was a fluent liar, or so it seems from the glimpses of his life we receive in scripture, acknowledging that we are reading an overview, not a full biography. Even though he has just come from wrestling with God and “prevailing”, in the words of his fellow combatant, he quickly returns to form in the presence of his brother. 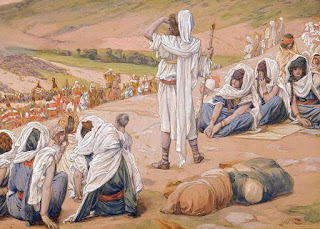 Having just returned from somewhere between twenty and forty years abroad and with nowhere urgent to be, Jacob and his family are expected to accompany Esau to his home in Seir. Let’s be real here: Jacob has no intention of doing any such thing. And yet the heir to the earthly promises of God not only allows Esau to believe yet another falsehood out of his mouth, he actively feeds it. Part of Jacob’s perpetual dishonesty may have been cultural. Yes, he was an unusually manipulative character, but there is a verbal dance going on in Genesis 33 that appears on both sides to be almost completely disingenuous. Westerners who have never experienced the pervasiveness of haggling and schmoozing in the East are likely to take the dialogue at face value, but I suspect the subtext I read into the exchange between Jacob and Esau is more likely its real meaning. Jacob then replies, “Seeing your face is like seeing the face of God.” This is not the only over-the-top groveling we find the Old Testament (2 Samuel 14:20 is another example). Perhaps the expression was a common one. It is probably intended as hyperbole rather than blasphemy, but it is still excessive. At best it means something like “The fact that you haven’t killed me makes me realize God is at work here.” At worst it is gratingly patronizing. Esau responds, “I have enough, my brother; keep what you have for yourself.” This may be true, but it is not the point. The man who wishes to appear greater cannot acknowledge even such a huge bribe as Jacob’s as a significant increase to his wealth; to do so would diminish him in the eyes of his 400 men. This is part of the dance. It probably means something like “Your piddling little gift means nothing to a man with riches like I have.” Oh, we know Esau has every intention of accepting it eventually; the extravagance of the gift is public evidence of Jacob’s recognition of his power and greatness. But custom and pride will not allow him to accept his brother’s gifts too eagerly. He needs to be further supplicated. So Jacob now says, “Please accept my blessing that is brought to you, because God has dealt graciously with me, and because I have enough.” Here the word Jacob uses to describe his gift to Esau is bĕrakah, or “benediction”, the same word used of Isaac’s paternal bĕrakah, which Jacob had stolen from Esau. This Hebrew expression is only very rarely used in the Old Testament to describe a gift; both mattan and shachad are more common. Jacob’s choice of words can hardly be unintentional. He’s acknowledging that this token, and perhaps more, is owed. It’s payback for the theft of Esau’s bĕrakah years before. From here the discussion turns to traveling to Seir with Esau. Jacob has no intention of going there, and Esau, who had spent at least 57 years living in the same household, surely knows this too, because he does not insist on having his way. Of all the people we know and understand in the world, it may be our siblings we read most accurately. Esau might be fairly accused of spiritual dullness, but he doesn’t seem to lack ordinary powers of observation. Still, the verbal game is played, and Esau takes his goodies and goes on his way. In all of this, the Spirit of God passes no editorial comment whatsoever. We are left to our own devices to interpret the exchange. But I notice that of all the haggling we find between Old Testament characters, only Abraham and David come across as genuine in their negotiations. This latter reference in Hebrews is usually taken to refer to Isaiah’s statement that he and his children were “signs and portents” in Israel. Very probably it does. Their names, literally “A remnant shall return” and “The spoil speeds, the prey hastens” signified coming events for the people of God. And certainly the wording of the quotation in Hebrews appears closer to Isaiah than Genesis. Naturally, I am far from the first person to whom this has occurred. The explicit identification of Christ with Israel goes back as far as the gospel of Matthew and has been touched on thousands of times since. If you haven’t thought much about the idea, Nicholas Batzig lays out numerous scripture parallels between Christ and Israel in this post. It’s a good study. Have a look. But back to my main point. The Genesis 33 narrative still refers to “Jacob”, but at the time he presents his children to Esau, Jacob has only just been renamed “Israel” by God. Thus, it seems to me that if your subject is the bringing of many sons to glory, as it is in Hebrews, the presentation to Esau of the children of Israel as evidence of God’s blessing upon him in Paddan-aram makes a much more logical and compelling allegorical point of reference than the Isaiah passage, in which the number of children is much smaller and the things of which they are omens are as frequently negative as positive. Here, Israel has already produced eleven sons and at least one daughter. Genesis provides the “many sons” of the Hebrews passage in a way that Isaiah does not. I cannot help but think that the picture in Hebrews of Christ, the true Israel, presenting the fruit of his years of labor in a “far country”, is nicely prefigured in the original “Israel” showing off his numerous progeny to his brother.